The olecranon, or tip of the elbow, has a small fluid-filled sac just outside of it to serve as sort of a shock absorber when putting the elbow against hard objects or to prevent friction during elbow range of motion. It is normally very thin. When it is inflamed, the bursa can become large and swollen. Typically olecranon bursitis manifests as swelling, although the amount of swelling in front of the olecranon can become uncomfortable. Typically it is not red or warm unless it is an infected bursa, which happens occasionally. 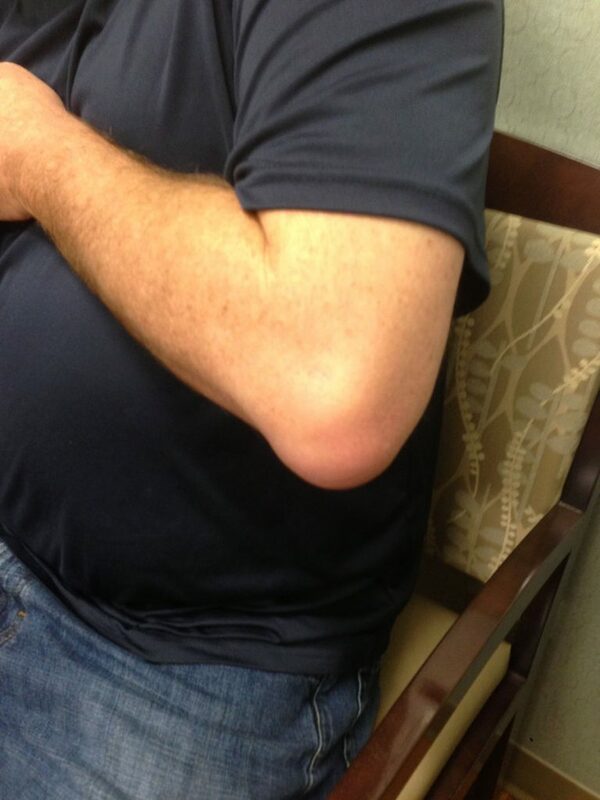 Occasionally patients can develop significant swelling of the olecranon bursa at the tip of the elbow (white arrow). Most patients with olecranon bursitis do not remember any specific inciting event. It is often seen in truck drivers who rest their elbows against the window or in car drivers or riders who rest their elbows against the windows or center console. 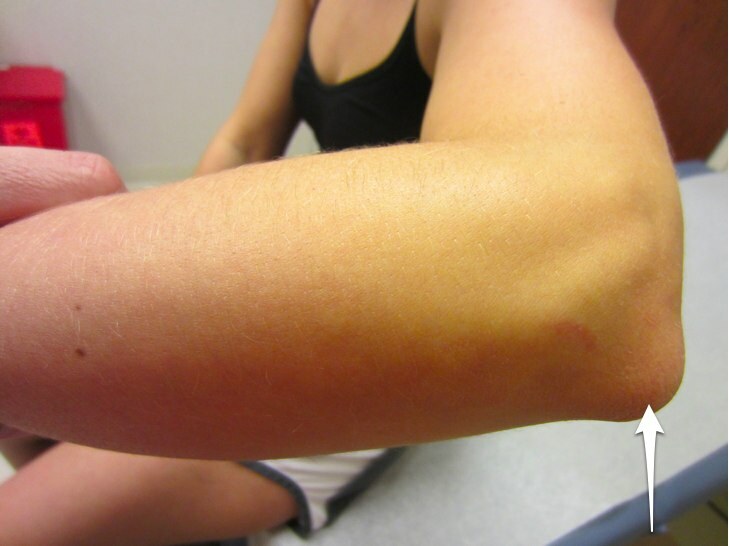 Most of the time the treatment for olecranon bursitis is symptomatic. I usually recommend that patients try icing the elbow to decrease the inflammation and possibly try anti-inflammatory medications. I try to avoid drawing fluid off, if possible. In my experience, very little fluid is actually withdrawn, and it often comes right back. Also multiple attempts at draining the fluid potentially increases the risk of infecting the bursa, leading to a septic bursitis that often requires urgent surgery. Sometimes draining the fluid off and injecting cortisone one time to try to keep the inflammation from returning is an option.